New CC Capture 1.1 has the ability to allow the user to log into the application using RFID cards. We will extend this to QR-code/barcode readers soon. This makes it very easy for the operator to authenticate in a very fast way. As all critical application setting are operator related it makes this feature very useful when one measurement station (Instrument + CC Capture on Mac or PC) is shared by more than one operator. Typically, it takes about three seconds to read an ID card, recognize operator and reload Capture based on a list of devices, tracks, measurement tasks that are assigned to the operator and finally send measurement settings into the instrument (time measured for X-Rite eXact Scan). If no additional task (like scanning Job ID or Customer ID) in about three seconds measurement Instrument is ready and the operator can start measurements. The scan of single row control strip like "Min G7" takes few seconds plus about two additional to get the report! No other software on the market offers such flexibility and speed when working with handheld instruments. 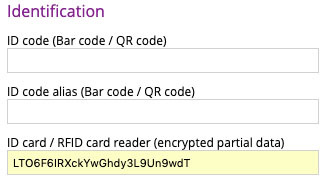 The system is very safe because the only portion of the coded serial number is encrypted with SHA-512, then reduced to a portion of data - finally ChromaChecker uses this unique "fingerprint", which is unusable for any other purpose. ChromaChecker is not reading, transmitting or processing any information that can reduce the customer's ID card system security. The user may decide to use an existing RFID system or they can have cards dedicated for ChromaChecker solution. There are a variety of RFID card readers that are compatible with CC Capture. The general rule is that it requires a serial connection - and we recommend virtual serial port (USB COM). Please refer to CC Manual to learn more. Be sure that your RFID card reader is connected before Instrument.